At this year’s Alpha Omega Alpha induction ceremony, the medical honor society welcomed 36 new members including students, residents, fellows and faculty. Photo by Nathan Mandell. In a ceremony on March 13, the Alpha Omega Alpha (AOA) medical honor society welcomed 36 new members into the Northwestern chapter on the basis of outstanding scholastic achievement and significant contributions to medicine. “I’m incredibly proud of my classmates who are also being inducted, it’s nice to celebrate this together,” said Susan Duyar, a fourth-year medical student who is also pursuing a master’s degree in Medical Humanities and Bioethics and is pursuing a career in obstetrics and gynecology. Prior to the induction ceremony, AOA visiting lecturer John H. Newman, MD, the Elsa S. Hanigan Professor of Pulmonary Medicine at Vanderbilt University Medical Center, delivered a keynote speech on the most recent endeavor of his lengthy academic career: working with the Vanderbilt Center for Undiagnosed Diseases, part of the National Institutes of Health (NIH) Undiagnosed Diseases Program. “We want patients who have been on a diagnostic odyssey and nobody can figure out what’s wrong with them,” Newman said. Newman briefly summarized the history of the NIH program before taking the AOA audience through the twists and turns of a recent case: a man experiencing a series of mysterious inflammatory and stroke-related ailments, starting in his late 20s. 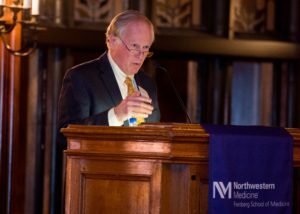 AOA visiting lecturer John H. Newman, MD, the Elsa S. Hanigan Professor of Pulmonary Medicine at Vanderbilt University Medical Center, delivered a speech on lessons learned during a career in medicine. Photo by Nathan Mandell. After performing genetic sequencing on the patient’s family members, narrowing down suspicious gene variants and modeling phenotypes, Newman’s group eventually found a probable cause: extremely high levels of IgG4, an antibody secreted by plasma cells that is associated with a rare class of inflammatory diseases. Following the lecture, guests attended the induction ceremony, where Shilajit Kundu, MD, ’07 GME, chief of Urologic Oncology in the Department of Urology, thanked faculty and members of the selection committee and welcomed inductees and their families. Kundu recounted his own induction experience, stressing how important it was to both himself and his family. Marianne Greene, MD, senior associate dean for Medical Education and Sandra Sanguino, ’93 MD, ’96 ’99 GME, MPH, associate dean for Student Affairs, welcomed 27 medical students into AOA and handed over their diplomas. “It’s a huge privilege and incredibly humbling to be inducted not only alongside my classmates, but to be initiated into this larger intellectual community,” said Sara Mills, a fourth-year medical student who is planning a career in general surgery. Mills and Duyar were inducted along with their peers; Olga Alexeeva, Sarah Brooker, John Campo, Lucy Chao, Davide Cina, Charles J. Cogan, Erika Cornell, Joseph DiDomenico, Rebecca Edwards, Jennifer Fligor, Sara Fossum, Ajay Haryani, Ivy Huang, Saya Jacob, Eric Keller, Jakop Lupa, Rachel Ruderman, Madeline Schwid, Jana Shapiro, Joshua Stein, Matthew Sullivan, Taylor C. Sutcliffe, Michael Vu, Vanessa Welten and Douglas Wilcox. 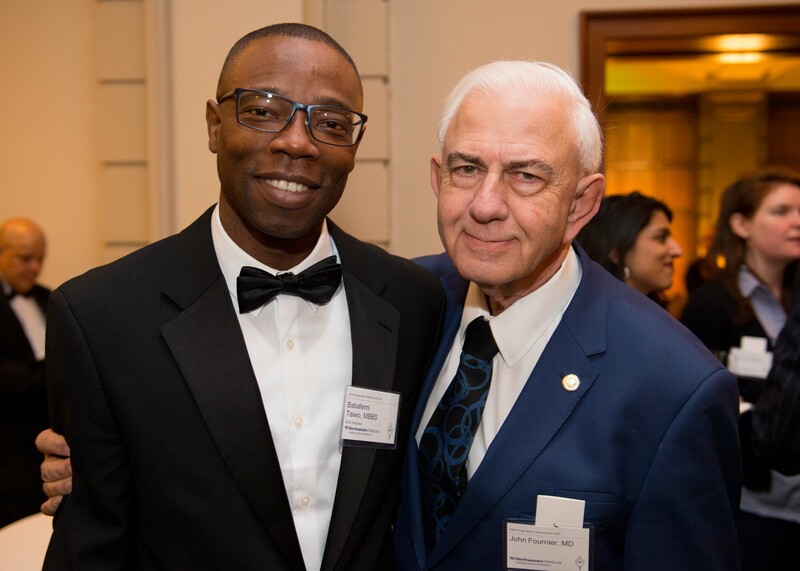 New AOA inductee Babafemi Taiwo, MBBS, ’06 GME, chief of Infectious Diseases in the Department of Medicine and Gene Stollerman Professor of Medicine, and John Fournier, MD, clinical assistant professor of Ophthalmology. Photo by Nathan Mandell. New housestaff and faculty members were announced by Kundu, who praised them for their leading roles in teaching, clinical care and scientific discovery. Housestaff inductees included Stephen Chiu, MD, resident in surgery; Sara Chuzi, ’14 MD, chief medical resident in internal medicine; Katherine Hekman, MD, PhD, resident in vascular surgery; Chad Purnell, MD, resident in plastic surgery; and Jessica Walter, MD, resident in obstetrics and gynecology. Faculty inductees included Joan Anzia, MD, vice chair for Education in the Department of Psychiatry and Behavioral Sciences and professor of Psychiatry and Behavioral Sciences and of Medical Education; Mark Eskandari, MD, chief of Vascular Surgery in the Department of Surgery, the James S. T. Yao Professor of Vascular Surgery and professor of Medical Education and of Radiology; Babafemi Taiwo, MBBS, ’06 GME, chief of Infectious Diseases in the Department of Medicine and Gene Stollerman Professor of Medicine; and Alexis Thompson, MD, MPH, professor of Pediatrics in the Division of Hematology, Oncology and Stem Cell Transplantation. In his closing remarks, Newman advised all new AOA members to take their work seriously but not take themselves too seriously, and to follow wherever their passions lead them. However, he saved the last word for the student inductees.